・The compact knife mechanism in a single unit enables simple maintenance. ・Clean sewing with no oil staining. ・Wide-variety pattern sewing is available. The Z-8550A and Z-8560A are equipped with a sealed oil tank, supplying constant clean oil only to the rotary hook. can keep valued products clean. The basic 8 types, 14 sewing patterns are built-in. Users do not need to have multiple cams for each sewing pattern, which allows excellent cost performance. With the electronic zigzag stitchers, the needle moves perpendicular to the material so that needle deflection does not occur even at high speed sewing. Furthermore, the pulse motor with servo control, adopted for the zigzag mechanism, prevents position slippage. Video of Electronic Direct Drive Zigzag Lock Stitcher Z-8550A/Z-8560A. 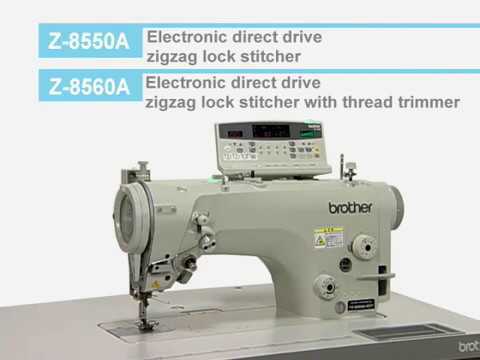 Video of Electronic Direct Drive Zigzag Lock Stitcher Z-8550A/Z-8560A. You can see how this industrial sewing machine is contributing to the owner, mechanics and operators.